Addmotor MOTAN M-70 is an all-purpose electric urban cruiser bike and a great choice for anyone seeking fun, ready-for-adventure transportation. Simplistic styling blends cool retro with latest e-biking technology. 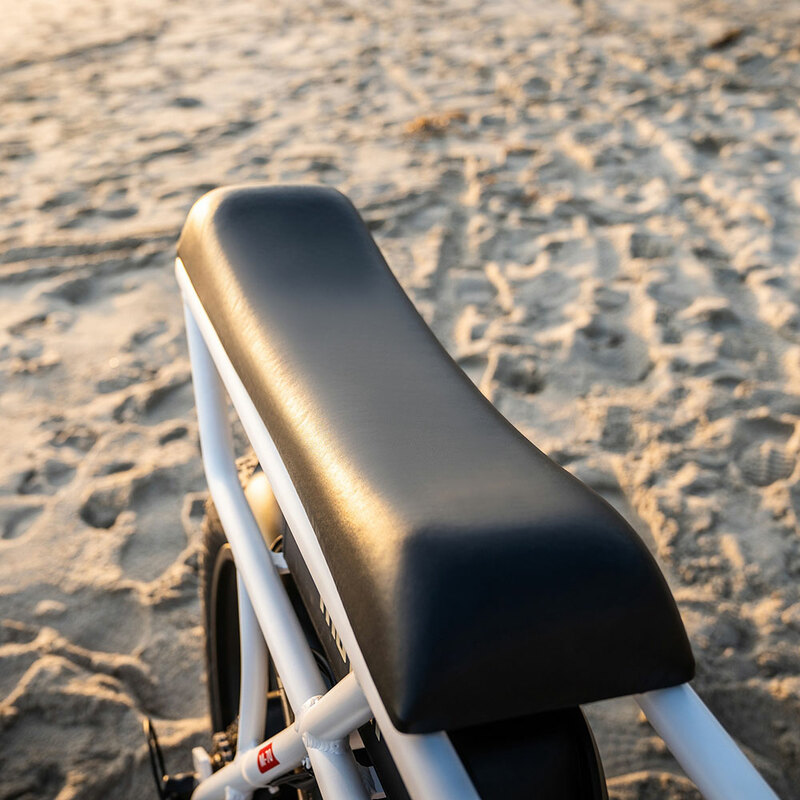 Natural upright riding position and long plush bench seat makes it a pleasure to ride. Street legal/insurance/registration. Up to 30mph and 45 miles (PAS) per charge. Works as peddle-assist, or throttle. Ride it anywhere! Cool and Unique Retro Appearance. With it's 6061 aluminum strong frame and flash aluminum alloy integral wheel, the MOTAM M-70 cruiser bike is stylish and masculine. It's no wonder it's also called a mini electric motorcycle! Large Powerful Motor. 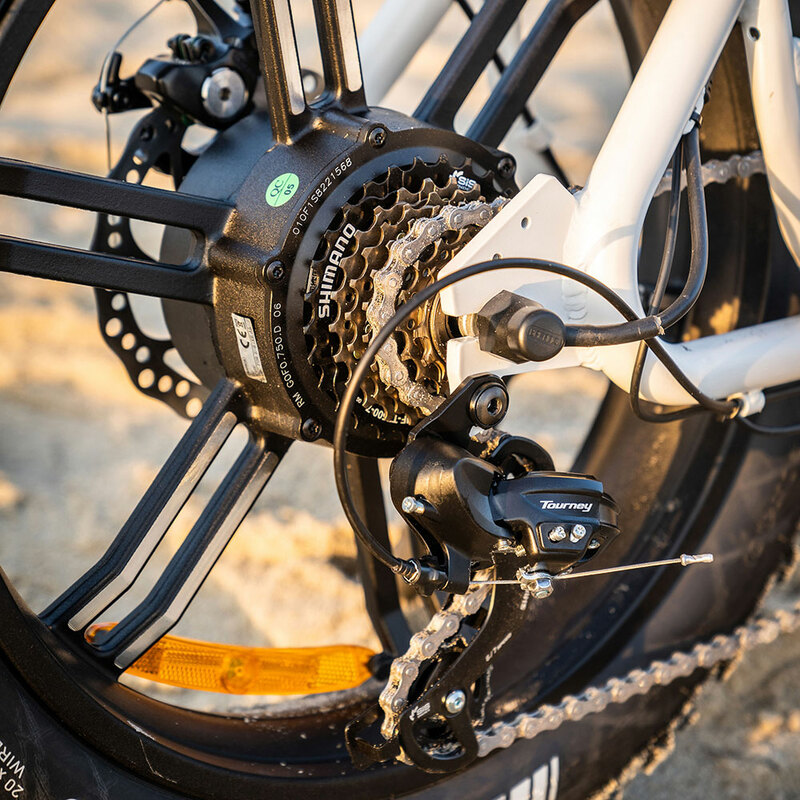 Equipped with a 48v 750 watt brushless DC hub motor,this bike performs well on long distances and is powerful enough to reach 30 mph with pedal assist. Conquer the beach, snow, mountains - any terrain! Excellent braking for worry-free riding. Long Lasting Lithium Battery. A 14.5AH long lasting lithium battery is mounted under the saddle with a hidden controller, giving a sleek appearance while saving space. Enjoy long distance riding, up to 45 miles using level one pedal assist. Battery completely recharges in only 4-5 hours and is removable and portable. Leave your bike outside while your battery conveniently re-charges in your home, office, etc. Integrated Lights for Safe Trip. 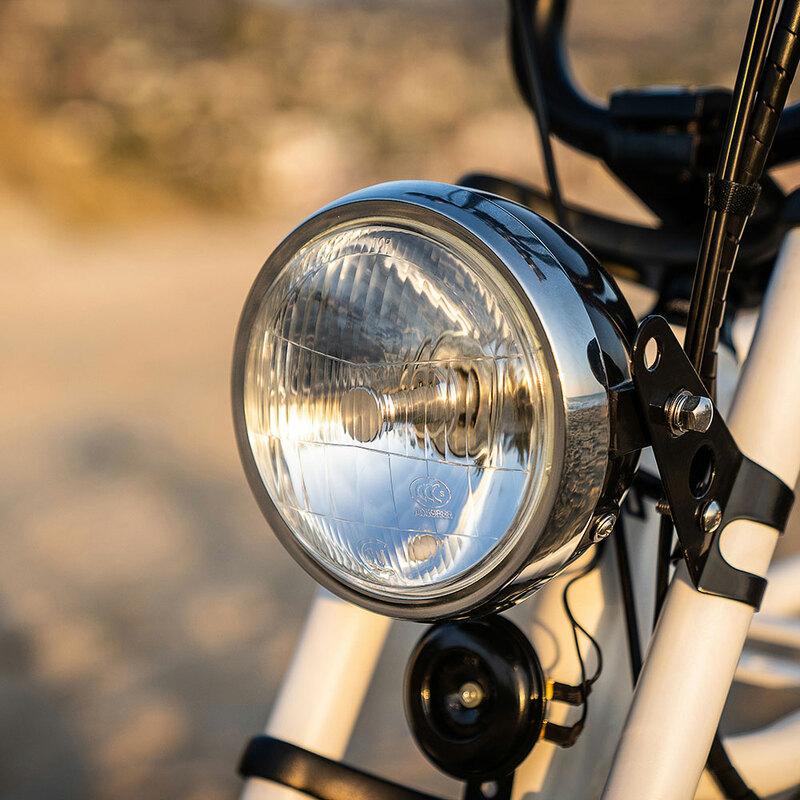 Different from other models, the MOTAN M-70 has a bright motor LED headlight with a powerful horn.There is a brake taillight with turning signal in the rear. All the lights are extremely bright to ensure safety on the go, even at night. Super Smooth and Comfortable Ride. 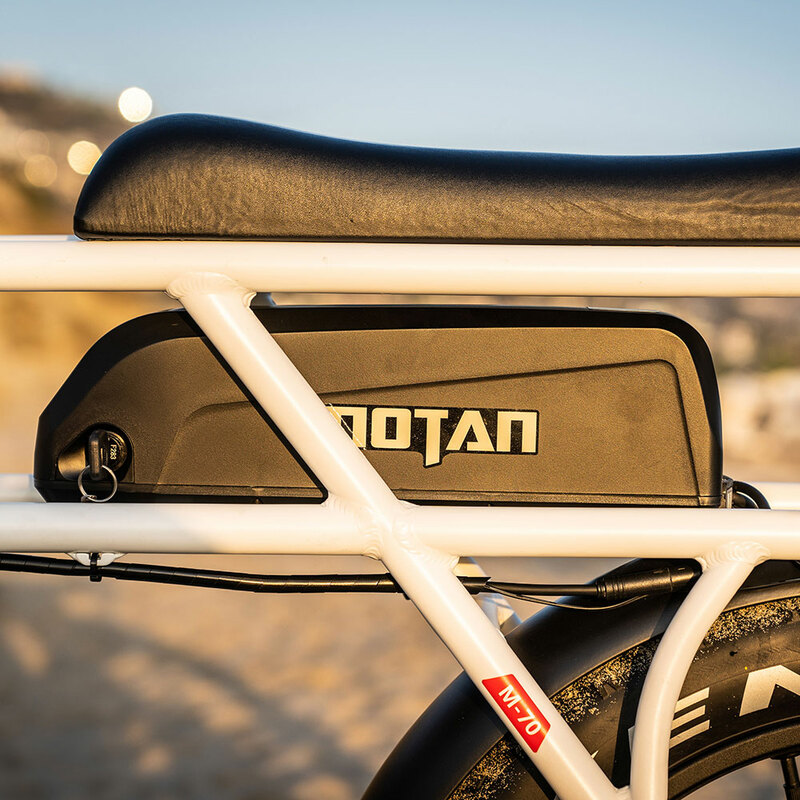 The MOTAN M-70 is designed specifically for riding comfort.It’s nature riding position and plush motobike beach seat make it a pleasure to ride.Plus,the ultra wide 4’’ pneumatic fat tire absorb all but the biggest bumps. Pedal Assist for Extended Frame and Throttle Control. The bike offers three modes of “muscle power’’,“throttle control’’ and “ pedal assist” with Shimano 7 speed TX300D gearing derailleur to allow you to cruise effortlessly and get to a higher top speed.Give your motor an extra boost and extend your range in the pedal assist mode.You can select between 1-7 levels of pedal assist or you can turn it off to get more exercise. Use the throttle level and enjoy the ride without any pedaling at all. Clear LCD Screen Display. A large 5-inch Addmotor LCD screen display mounted on the front tube displays the vital information clearly including the range,speed,battery status and riding mode,all the features will well meet your need on the road. The Strong Frame Can Easily Carry Up To 300Lbs and Suitable for 5'2''-6'2''. Note: To Prevent Any Risk,Please Make Sure The Battery Is In A "Locked" Condition Before You Ride The Bike.